The flipped classroom, also known as the inverted classroom, is rapidly catching on as increasing numbers of educators begin to experiment with this new way of teaching. According to the THE Journal, the number of active members of the Flipped Learning Network’s community site has increased from 2,500 to more than 15,000 since 2012. And a recent survey by Campus Technology revealed that 3 in 5 teachers have already flipped their classrooms or are planning to do so. Under the flipped classroom, the traditional order of classroom events is reversed. Students view lecture materials, usually in the form of video lectures, as homework prior to coming to class. In-class time is reserved for activities such as interactive discussions or collaborative work — all performed under the guidance of the teacher. Although breakthroughs in technology have certainly made flipping the classroom a practical option, teachers are choosing to flip their classes simply because it enhances the learning experience. Students can consume lecture materials at their own pace. In traditional lectures, students are bound to the pace that the instructor sets for the course. If a student has difficulty understanding a concept during a lecture, he or she is forced to slow down the rest of the class by interrupting and asking for additional clarification — or do his or her best to keep up and ask for guidance at the end of class. By contrast, in flipped classrooms, students can review and replay any parts of the lecture that they’re having trouble with as many times as they need. If students continue to have issues, they are able to come to class prepared to ask specific questions about the concepts that give them pause. The teacher is present while students apply new knowledge. In the traditional classroom, students show what they’ve learned in class through homework. This order of events is suboptimal because, at home, students typically do not have resources to turn to should they have questions. Consequently, a student must wait until the next class session or wait until the professor’s office hours to receive help — or turn in incorrect homework. Bringing homework into class time gives teachers insight into which concepts, if any, that their students are struggling with and helps them adjust the class accordingly. Results from flipped classrooms show promise. There is growing evidence that the flipped classroom model can improve student achievement in nearly any subject. According to the Flipped Learning Network, 71% of teachers who flipped their classes noticed improved grades, and 80% reported improved student attitudes as a result. What’s more, 99% of teachers who flipped their classes reported that they would flip their classes again the following year. Interested in flipping your classes? 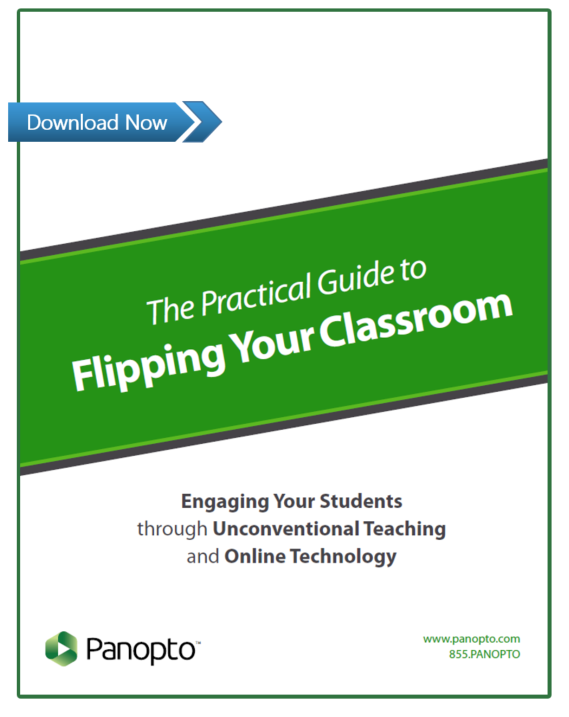 If you’re starting to think about incorporating flipped classes into your teaching methodology, download our complimentary white paper: The Practical Guide to Flipping Your Classroom. In it, you’ll learn more about the technologies you should consider when making the flip, as well as additional resources for ensuring that you’ll have a successful first flip.